Caunes-Minervois is a French community, located in the department of Aude in Occitania region. Its inhabitants are the Caunois. It is popular with tourists visiting the abbey site (site of the Cathar Country) and the quarries of red marble. At the foot of the Black Mountain, slightly overhanging the plain of Minervois Caunes-Minervois is crossed by the Argent-Double, small tributary of the Aude. The town is known for the quality of its marble, used in many monuments such as the Palace of Versailles. 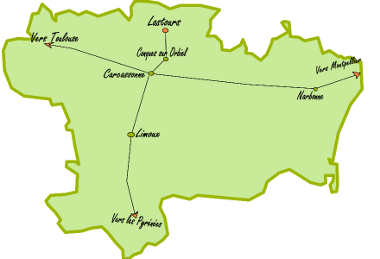 The commune is located on fault lines in contact with the south of the Hercynian massif of the lower Massif Central (the Montagne Noire) and the alluvial plain of the Aude. The municipal territory is thus gently sloping towards the south with well-drained grounds which favor the cultivation of the main vineyard, which has been the source of income for several generations since the nineteenth century. The city of Caunes-Minervois is built around its Benedictine abbey founded in 780 by the abbot Anian, friend of Saint Benedict of Aniane. Originally placed under the direct protection of the king, the monastery passed into the hands of the counts of Barcelona before falling to the Trencavels, who renounced their rights in 1195. During the crusade against the Albigensians, the Abbot de Caunes received several times the representatives of the Pope, who had come to preach Catholic orthodoxy. In 1226, Pierre Isarn, Cathar bishop of Carcassès, was burnt at Caunes. The thirteenth and fourteenth centuries were marked by conflicts for power between secular and religious authorities and by a certain prosperity of the monastery, which considerably increased the number of its members, from fifteen to thirty. The establishment of the Commende in 1467 constitutes the high point of a long period of relaxation of the monastic values in Caunes. It was not until the beginning of the seventeenth century that a series of reforms was initiated by the Abbe Jean d’Alibert. He restored the buildings and rebuilt the abbey house. Then, the congregation of Saint-Maur took possession in 1663 and rebuilt the monastic buildings. The abbey was alienated in 1791, with the exception of the church which became communal property. The church was classified historical monument in 1916, the abbey buildings in 1948.